There is a verse in the Bible that says God is able to give us more than we ask or think. Over at The Bargain Shopper Lady there is a story about her Christmas and how a stranger gave her and her husband a real blessing. She has challenged us bloggers to share a story of when strangers helped us and blessed us so that our stories may encourage and bless others. I decided to share two stories of the many with you. One is on this blog and then another on my blog Ain’t No Place To Put A Sticker . My most memorable Christmas, and I know the one my kids remember the most also, was because of strangers. Let me share the story. My first husband was a pastor and at one point decided to take a year off and return to Seminary for his next degree. We had 5 kids and this was truly a move of faith. We could not find housing before we moved so we lived in our pop up camper. 21 feet long, five kids, two dogs a guinea pig and my husband and I. We were sure it would be for a week or two and then we would find something. My husband did have a job lined up and so the housing seemed minor. First thing that happened was the job fell through. It took him some time to find another job and we were down to pennies, no home, kids to feed and he was trying to study as well. We would come back to bags of food setting on our picnic table. We had no idea where they came from, and never did find out. Blessings! Finally in mid October, with ice on the puddles and the winter setting in, we found a place to live. He was working such a low paying job we needed something cheap, and that was what we got! A 22 X 24 house, built on a hill with a garage door under it to get to the space under. The little brown house as we called it. Once we brought in our furniture and boxes of stuff from the 13 room house we moved out of, all we had was a walkway in the room. Stuff was stored everywhere. Money was to the penny tight and Christmas was coming. A friend gave us some money which allowed us to tell the kids we could spend $15 on each child, so we wanted them to tell us what they wanted since that was all we had. The girls immediately asked for Cabbage Patch dolls! They were just out and cost over $30 each! I am sure you can remember the war there was over these dolls when they came out! I went to the craft shop and for the $15 I was able to get the heads and body fabric and make them each their doll. I then dressed the doll in the outfit they wore when they came home from the hospital. It was special to me and I hoped it satisfied the girls. Right now, I can’t remember what the boys wanted, but I am sure it was equally as expensive! About a week before Christmas I got a phone call from the school saying that they wanted to provide us with a Christmas meal. The kids had been collecting food for the needy and we sent some in with them, only to find we were the “needy”. I went to the school to pick up the “meal” and there was boxes of food! Not only food, but boxes and boxes of presents! Here we were in this little house, filled with all our junk and cramped so much our Christmas tree was a little pre-decorated one that stood about 18 inches high, including the container and now I had boxes and boxes of food a presents! I “hid” the presents on our boxes of stuff, all in plain sight and shoved the food into the little bit of cabinet space we had and the rest sat on boxes too. When Christmas came and we put out all the gifts they were flowing every where! Our kids were so blessed that year with things they wanted, needed and loved. There is no way to tell you the endless amount of items that was there. It was the most beautiful Christmas we had and all because of total strangers. When God says He supplies your needs and gives abundantly above all you can ask or think, He really does. When you know He cares this much, trusting Him should be easy. 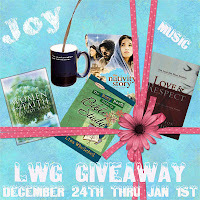 Laced with Grace is starting out the New Year with a giveaway. You do not need to have a blog to compete for the giveaway, just go to the site and sign up for a chance to win. Giveaways are not only fun, but they give us all a chance to find other blogs to read as well as a chance to win some nice and useful gifts. I try to participate when I find them and then offer the chance to my readers as well. Hope on over to Laced with Grace for full details and to sign up! How was your Christmas? It is hard to believe you go through all the preparing and it is done in no time and gone. This year I also came down sick and spent much of the weekend before in bed. I am still dragging and needing a rest every day. I had the flu vaccine and ended up with flu like sickness. I think I will take my chances next year! I did enjoy having family together. Everybody pitched in with the meal and all I had to do was the ham and potato salad. My husband made brisket and the rest was brought by the kids and my sister in law. We had 13 of us here, counting the three babies. One thing that I am always amazed at is the little ones. They take everything in and try to figure it all out. The are awed by the lights and decorations, intrigued by the gifts and try to figure out why there is candy hanging on the tree and not being eaten. I have never shied away from a Christmas tree when the kids were little, and I do not now with the grand kids. I just try to make them a bit child friendly. All my ornaments are non breakable, I have candy canes and other things for decorations. I found it rather amusing when I found the one year old granddaughter sitting under the tree with the dog. She would grab a candy cane off the tree, eat it to the hook and then let the dog finish it while she went for another. Today I took her into the store to look for some sales and see what was there. She wanted to look at everything. In training her not to beg (at least I hope so!) I let her look at things, touch them and then we put the back. So far she is a great shopper! We look, feel, say ahhhhhh over and put it back and go to the next thing. I had so much fun with her today looking at all the Christmas stuff and then putting it back. I was doing a bit of thinking as I watched her face and as I watched the others on Christmas day. 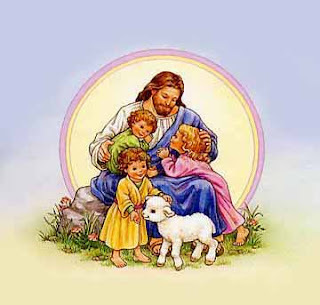 God says we are to be like little children, and must come to Him as a child. Do we? Do we look at life for its beauty? To we look at His word for all we can find out? Are we awed by Him? Or are we clinging to the world, or our grown up attitudes and answers? I found my self examining me and asking how much was I like this child? Or am I rushing through life not looking for what is there, what God may have for me, or want to say to me. As the New year approaches, let’s get our child like faith in line with Him. Become as children in our faith, awe and discovery of what He has and Who He is. Christmas is tomorrow, can you believe this year will be over in a week? It is hard to believe that Christmas is here already. For me it just seems to hit so quickly this year. I am sure there are others out there who’s family is as separated as mine is and wonder how you all handle it. For me, I have family here in Texas, a daughter in NC, mom and siblings in the NJ-PA area and 4 kids, spouses and grand kids in ME. I want to be with everyone! Friday I finally got our tree up. For the first time in my life I have an artificial tree. I could not find a nice one for a decent price in our area. See my story here. TO me the tree has a meaning and it all points to Christ. To see an evergreen tree cut down reminds me of the everlasting savior being hung on a tree for me. The lights remind me that HE is the light of the world, the everlasting light to guide us through the darkness that the world lives in. We put ornaments on the tree, different color balls, small packages etc. Christ gave the greatest gift, our small packages remind us of those gifts. Some say the colored balls stand for all the peoples of the world and how Christ died for everyone. The beauty of the tree reminds me of Christ and His beauty that He came to die and we can have that beauty in us if we trust Him and follow Him. I am sure there are more symbols I am not mentioning, like the star at the top of the tree or the angel. They all signify His birth and coming to this earth to die for us. Be sure to spend time with your family talking over the real meaning of Christmas. I have a real problem at Christmas. We teach our children not to lie, yet we lie to them about Santa giving presents. I would like to explain my convictions. Besides the lying, there is a real plan by Satan himself to take away from anything to do with Christ. He wants to confuse us, make things seem harmless that are really anti-God and get our minds to ok things that are substitutes for true Christian living. Santa draws a bigger crowd that Christ. How does he do it? By becoming a tangible counterfeit. I just made a small list of some of the attributes of God and of Santa. Satan has designed him to counterfeit our Lord, yet Christians find him harmless to tell their children. If we are telling our children that there is a Santa and later they find there is not how will this not only conflict with you telling them not to lie, but also their relationship with the Lord? We can’t see God. Yet it takes faith in an unseen being to be saved. Will this not throw doubts on their faith? I look at anything that is a counterfeit Christ, or anything that pulls our attention from the real meaning of the day (same goes for Easter bunny etc) as a form of an anti-Christ that is put there by Satan’s design. I know it is hard to buck the world. 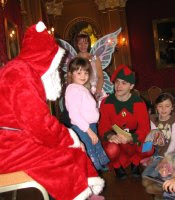 I never told my kids there was a Santa, they never believed it and thought it was just something funny that people believed in. I remember one year I had my 2 yr. old in the shopping cart and a man behind us was asking her if Santa was going to come and bring her lots of things. She just smiled, and then the man , maybe in his 40’s, went on for a bit and she just smiled some more. As we were leaving him, my 2 year old said “I guess his mommy never told him there was no Santa”! We had people not want our kids to play with their kids when it was near Christmas, Christian parents! who thought that it would ruin the day for their kids if our kids told them. “Speak the truth in Love” “Teach your children” “Lie not to one another”, the Bible is clear about what we should be telling our Children and teaching them. Take a stand for the Lord and bring out the joy of what God did for us and that we give because HE gave the greatest gift of all HIS SON!